2. Studies have shown that acupuncture points have significantly more electrical conductivity than areas of skin without acupuncture points. 3. Acupuncture can increase the success rate of In Vitro Fertilization (IVF) up to 65%. 5. The U.S. FDA classified acupuncture needles as medical instrument and assured their safety and effectiveness. 6. 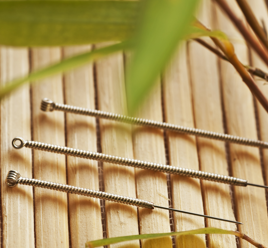 Acupuncture needles are single use, sterilized and pre-packaged. 7. Acupuncture is over 5,000 years old and is one of the oldest practicing forms of medicine known to date. 8. When performed by a properly trained and licensed practitioner, acupuncture is safe and effective, free from negative side effects. 9. Even though a needle is being inserted into the skin, acupuncture is virtually painless. 10. Acupuncture needles are a lot smaller than standard hypodermic needles, and they do not draw blood and are not hollow. 11. Acupuncturists feel your pulse and look at your tongue to gain a better understanding of what is going on inside the body. 12. Acupuncture is highly individualized – for example, if 50 people with the common cold got acupuncture, all 50 people could have different acupuncture points in their treatments. 13. The benefits of acupuncture are sometimes difficult to measure when using western research because western research depends on a constant variable to measure all data against…something that goes against acupuncture treatment plans. 14. Licensed acupuncturists attend an in-depth four year program and obtain over 1,000+ clinical internship hours.